Our unique approach to portfolio construction sets us apart in an industry populated with proprietary products and outdated brokerage models. We tailor investment portfolios through a core and satellite approach that provides our clients with individual stock or bond exposure as well as inexpensive index exposure. 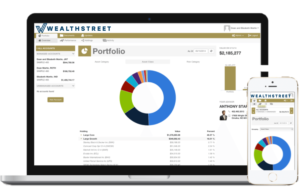 Wealthstreet offers some of the most innovative and modern performance reporting in the industry. The firm has made a considerable investment in its investment technology platform, offering clients an online portal for daily review across multiple custodians in a concise and interactive format.